The Professional Landcare Network (PLANET) hosted its 18th annual Renewal & Remembrance event July 28 at Arlington National Cemetery. 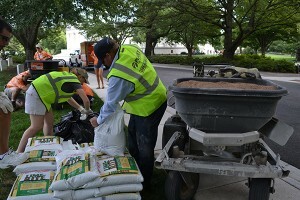 The beautification effort drew hundreds of landscape industry volunteers from around the U.S. for a day to apply lime and gypsum, aerate, plant and do tree and irrigation work to roughly 180 acres of the cemetery’s grounds. Denoted as “the largest landscape industry day of service in the country,” according to PLANET, this year and for the past several years, organizers have capped the attendance due to capacity restrictions. Now, the max is 400 and it’s a sell-out every year. In total PLANET volunteers applied 78 tons of lime to 180 acres; applied 22.5 tons of gypsum to 86 acres; aerated 50 acres; installed lightning protection to five trees and cables to seven trees, among other services.